Your team is always expanding. You have new staff and photographers or other vendors who could benefit from accessing your portal, whether to upload their content directly or to download files. Go to Admin at the top of the page. Click on Users & Permissions in the dropdown. 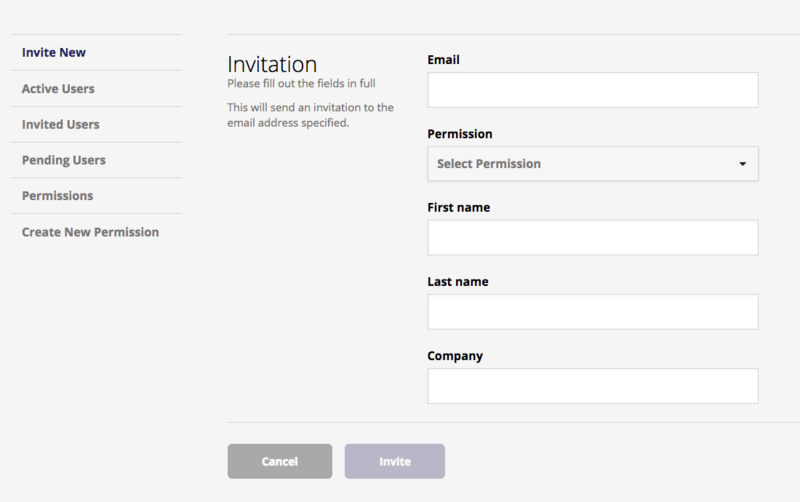 Fill out the new user's email address and assign the permission level that you want them to have. Click Invite to send an email to that user with an account creation link. They will receive a personal registration link to create a username and password. If you need to d a bulk invite of users, please contact support@imagerelay.com and we can assist on your behalf. The Invited Users page will show users who have been invited, but who have not yet signed up for Image Relay. You can revoke the invitation or Re-Invite from here with one click. All users currently signed up are found under the Active Users page. Pending Users are all users who have requested access from the login screen and have not been approved yet. This feature not available on the Small Plan.